[A person] who enters into a bath house2 [should] pray two [prayers], one as he enters [the bath house] and one as he exits [the bath house]. As he enters [the bath house] he says [the following prayer]: May it be Your will, Hashem, my God, that you will bring me in peace and you will take me out in peace. And may there not happen with me a disaster. But if a disaster will happen to me may my death be a forgiveness for all of my sins.3 [However] save me from this and anything similar to it in the future. [If] he exited in peace he says [the following prayer]: I thank You, Hashem, my God that you took me out in peace. So may it be Your will, Hashem, my God, that I will come to my place [of residence] in peace. הנכנס ל בית המרחץ מתפלל שתים אחת בכניסתו ואחת ביציאתו. בכניסתו אומר יהי רצון מלפניך ה’ אלהי שתכניסני לשלום ותוציאני לשלום ואל יארע בי דבר קלקלה ואם יארע בי דבר קלקלה תהא מיתתי כפרה על כל עונותי, ותצילני מזו ומכיוצא בה לעתיד לבא. יצא בשלום אומר מודה אני לפניך ה’ אלהי שהוצאתני לשלום. כן יהי רצון מלפניך ה’ אלהי שאבוא למקומי לשלום. The Tosefta continues on the same subject from the previous Tosefta. It is not related to any Mishna. The Tosefta is referring to a Roman bath house, known as the Balneae or Thermae in Latin, which were very common in the Land of Israel in Talmudic times. Ruins of many of them can still be seen today, for example in Masada and Caesarea. There was a room in each bath house called the Caldarium which contained the actual hot baths. The walls and the floor of the Caldarium were hollow where the opposite dividers were connected by stone pillars. Hot air was passed inside these hollow walls which kept the room extremely hot all the time. The mosaic floor of the Caldarium was built directly above the hypocaust, a type of a central heating system, where hot steam was pumped in between the stone pillars. The furnace itself where the fire burned was built either on the side of the hypocaust or directly below it. See William Smith, Charles Anthon (editor of the American edition), “A dictionary of Greek and Roman antiquities”, Volume 2, edition 3, 1843, entry Baths, p. 151. The idea was to have the furnace as close as possible to the hot bath so it could be kept as hot as possible. 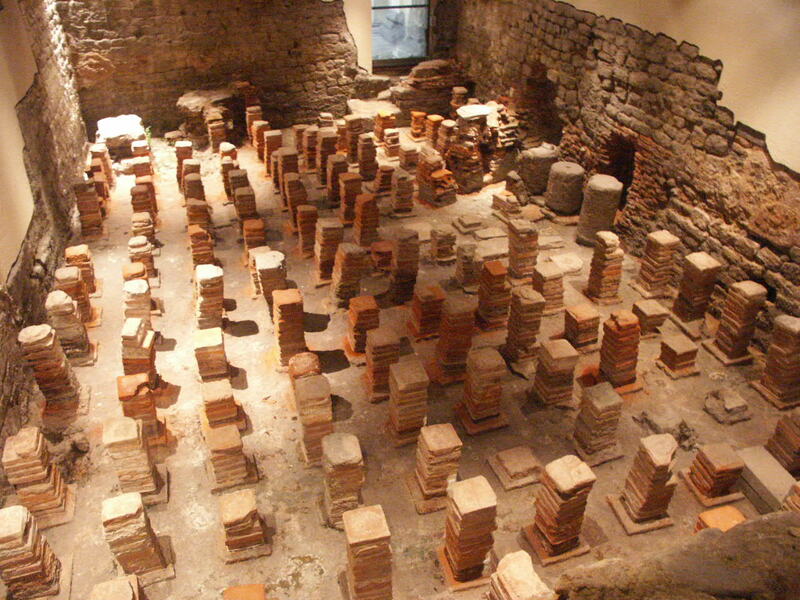 Often the floor would get so hot that the material from which it was made would burn through and the people in the Caldarium would fall down directly either into the hot steam in the hypocaust or even further down directly in to the fire of the furnace, and get killed. 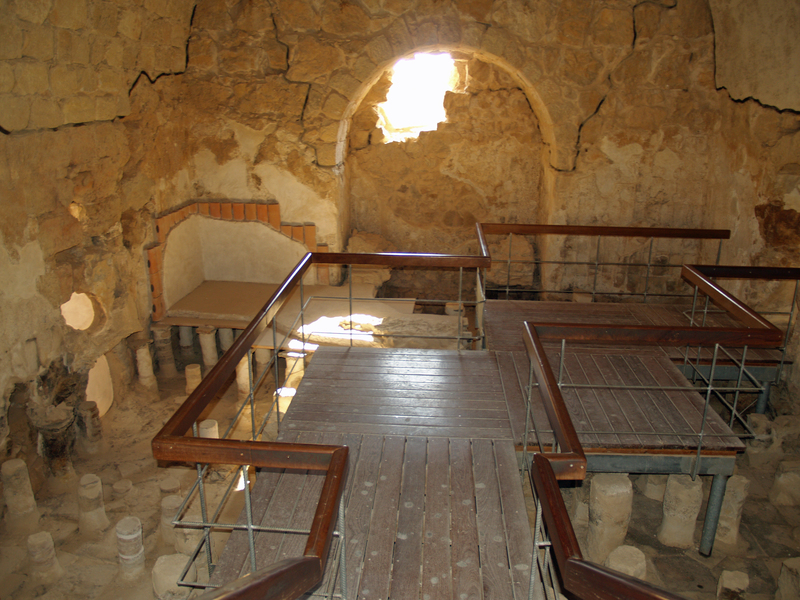 Talmud Bavli (Berachot 60a) relates a story about Rebbi Avahu, a Palestinian Amora of the 3rd century CE, who once went into a Roman bath house, most probably in Caesarea, where he lived, and the floor collapsed. However, Rebbi Avahu did not get killed, because he happened to be right above a stone pillar, so when the floor fell he remained standing on the pillar. He was also able to save a few people this way by grabbing and holding on to them thus preventing them from falling into the hot steam. In Talmud Bavli (Pesachim 112b) Rebbi Yossi Ben Rebbi Yehudah tells Rebbi Yehudah Hanassi not to enter a newly built bath house, because of the possibility of the floor collapsing. Obviously the Rabbis felt that there was a danger associated with bath houses, especially newly built ones or really old ones which were not repaired, although it is not clear how often accidents actually happened. Caldarium from the Roman Baths at Bath, England. The floor has been removed to reveal the empty space where the hot air flowed through to heat the floor. Notice the pillars between which the hot steam passed through. Rebbi Avahu escaped death due to one of these pillars. Caldarium from the Roman bath house at Masada, Israel. Remains of the original floor can still be seen in the left upper corner. Photo: David Shankbone. As was already explained in note 7 on the previous Tosefta, these prayers are not formal and therefore they do not have to be said in Hebrew and using the exact expression mentioned by the Tosefta. They were so informal that the Talmud Bavli (Berachot 60a) mentions the opinion of Abaye who says that the line “but if a disaster will happen to me may my death be a forgiveness for all of my sins” should not be said at all, because it is like jinxing oneself, that since the person mentioned death now it is going to happen. The expression that Abaye uses is “a person should not open his mouth to the Satan.” Abaye claims that this dictum, or if I may “superstition”, of not jinxing oneself with words originally comes from a Tannaitic teaching of the Tanna Rebbi Yossi or from a teaching of Reish Lakish who was a Palestinian Amora, which makes it difficult to accuse Abaye of being influenced by Zoroastrian superstitions prevalent in Babylonia during the rule of Sassanid Empire when Abaye lived, in the 4th century CE, since Rebbi Yossi was never exposed to Zoroastrian culture. However it is clear from this Tosefta that the Tannaim of the Land of Israel were not really concerned about jinxing oneself, especially during a prayer to God, since the opinion of Rebbi Yossi is not even mentioned. הנכנס לכרך מתפלל שתים אחת בכניסתו ואחת ביציאתו. רבי שמעון אומר ארבע, שתים בכניסתו ושתים ביציאתו. בכניסתו מה הוא אומר? יהי רצון מלפניך ה’ אלהי שתכניסני לכרך זה לשלום. נכנס לשלום אומר, מודה אני לפניך ה’ אלהי שהכנסתני לשלום. יהי רצון מלפניך ה’ אלהי שתוציאני מכרך זה לשלום. יצא לשלום אומר, מודה אני לפניך ה’ אלהי שהוצאתני לשלום. יהי רצון מלפניך ה’ אלהי שתגיעני למקומי לשלום. Mishna 4 of chapter 9 quotes the argument of how many prayers a person should say when he enters and exits a city. Our Tosefta quotes the same argument, but in the name of a different Tanna and quotes the text of the prayers that he should say. In the Roman Empire there seemed to be a prevalent notion that cities are more dangerous than villages due to rampant poverty, crime and desease. See Gregory S. Aldrete, “Daily life in the Roman city: Rome, Pompeii and Ostia”, 2004, p.4, p. 103-104. Roman cities including Rome itself, and obviously the cities in the Land of Israel had no police force of any kind. The responsibility to catch criminals rested on the people themselves. Since no one really cared much for the welfare of others outside of his own family the city could be a rather dangerous place especially for a visitor who does not have any connections and anyone to protect him from city criminals. It is interesting to note that Talmud Bavli (Berachot 60a) mentions the opinion of Rav Matna who says that the law of this Tosefta regarding prayers for going in and out of the city only applies to a city that does not have a court that has the authority to execute people, but if the city has such a court then the prayers do not need to be said. Rav Matna was a Babylonian Amora who studied under Shmuel in Nehardea, which places him in the first half of the 3rd century CE. This implies that in Babylonia in the 3rd century, which was under the control of the Persian Sassanid Empire (starting with Ardashir I in 226 CE), in cities that had a court in them that could perform executions there was a lot less crime than in other cities and therefore the prayers were not necessary. I am convinced that Rav Matna is not referring to a Jewish court, but rather to a regular Persian court, since by his time Jewish courts did not execute anyone, and even before the destruicton of the Bet Hamikdash when Jewish courts performed executions such occurencies were extremely rare. However it is possible that a Persian court could execute someone for a crime relatively fast and such executions were frequent, which would increase public fear and reduce crime. I do not think that presence of a capital court in the city meant that automatically there was a police force there as well which helped reduce crime. Even without police the mere fear of a possible execution would cause people to be more cautious about commiting crimes. The opinion of the Tanna Kama (the first Tanna) is that the person does not need to thank God for what already occurred. He only needs to request from God that nothing bad should happen to him. Therefore only one prayer with the request for the safe entry and for the safe exit is necessary. In the Erfurt manuscript the name of the Tanna who says this is Ben Azzai, just like it is in the Mishna. I have quoted the text to say Rebbi Shimon according to the Vienna manuscript. Rebbi Shimon holds that it is not enough to just request from God safe entry and exit, but rather a person should also thank God for providing him with a safe entry and exit. Therefore Rebbi Shimon adds a prayer of thanks upon entry into the city and a prayer of thanks upon exit from the city. In the Erfurt manuscript the text of the prayer reads, “Hashem, our God” instead of “Hashem, my God”. It seems to me that the way the Vienna manuscript quotes the text, “my God”, makes more sense, because this is a personal prayer that the Rabbis have not coined to the extent that the person must follow official text in Hebrew as obligatory prayers are, such as Berachot and Shemoneh Esreh, all of which always say “our God”. See the next note. Therefore the reading, “my God”, seems to be more applicable in this case. The Rambam (Perush Hamishnayot, Mishna Berachot 9:4) explains that this prayer is not formal as regular required prayers such as Shemoneh Esreh. Therefore a person is not required to face the Bet Hamikdash when he says it, is not required to prepare himself by setting his mind upon it, and it is not written in the formal text of a Beracha. But rather it is a personal supplication to God. Based on the Rambam’s explanation it seems that the Rabbis have not coined the exact text of this prayer, but merely suggested what a person should say. However this prayer does not need to be said in Hebrew and its text can vary some what. Based on this understanding of the Rambam it can be explained why the Rambam in his Mishna Torah does not quote the Halacha (law) that originates from Talmud Bavli (Berachot 29b) that a when a person goes out on a journey he needs to say Tefilat Hederech (A Prayer for a Journey). See Bet Yosef (Tur, Orach Chaim 110, Veharambam) who seems to be the first who asked this question. The Kol Bo (87, Hilchot Berachot, page 56a, right column, in the Lemberg 1860 edition), a halachic work by an anonymous Rishon (Medieval authority), says that this last prayer in our Tosefta that a person should say when he leaves the city is basically the same prayer as the prayer of Tefilat Haderech. I would like to propose that the Rambam agrees with the Kol Bo on this point and therefore since the Rambam already quoted the law from this Tosefta in Hilchot Berachot 10:25 he does not need to separately quote the law of Tefilat Haderech, because it would be redundant duplication. However, the Rambam disagrees with the Kol Bo regarding the point of how formal these prayers are. According to the Kol Bo Tefilat Haderech as well as the prayers quoted in our Tosefta, are formal prayers and therefore they should be said in the exact fashion that it is quoted in the Gemara, in plural form (i.e. “our God”, not “my God”) and end with a Beracha – Baruch Ata Hashem Shomeah Tefillah (Blessed You Hashem Who hears prayer), because that is the way the Rabbis have coined it, however according to the Rambam the text of Tefillat Haderech quoted in the Gemara is a mere suggestion and is not formally coined just like the rest of the prayers quoted in this Tosefta and therefore technically a person can say them in any language and using any expression he likes. Since there is no formal text of Tefilat Haderech the Rambam does not need to quote it in the Mishna Torah, but rather all he needs to say that a person should say some kind of a prayer when he leaves the city, as he did in Hilchot Berachot 10:25, and that would be sufficient for us to know that we need to say a prayer when we go out on a journey. As a side note I just would like to clarify that the whole long quote in the Kol Bo about Tefilat Haderech in the name of Ram (ר”מ) is not referring to the Rambam, but rather to Maharam Merutenburg who was sometimes called the Ram (Rabeinu Meir), and should not cause confusion. I have figured out the explanation for the argument between Rebbi and the Rabbanan regarding how many times the Beracha on Tefillin should be said. I have updated note 5 with my explanation. 5. For example, if the person would put on Tefillin in the morning and not take it off the whole day then he would only say the Beracha once before he puts it on in the morning. However if he decided to take a break from wearing it and took it off for a significant period of time then when he puts it back on again that same day he would have to say another Beracha. I have specifically used the example of Tefillin, because there is an argument in Talmud Bavli (Sukkah 46a) between Rebbi and the Rabbanan if a person would take off Tefillin in the middle of the day and then put it back after a significant break if he needs to say a new Beracha on it or not. This Tosefta follows the opinion of Rebbi who says that he would need to say a new Beracha after every interruption. It seems to me that Rebbi and the Rabbanan argue about whether the Beracha is made on the fulfillment of the minimum obligation of the Mitzvah only or if it is made any time the person fulfills the Mitzvah even if his performance of the Mitzvah is repetitious. According to Rebbi since the Mitzvah of Tefillin applies the whole day even though the person technically fulfils it by putting on Tefillin once, nevertheless since the Torah commands to wear Tefillin during the day for as long as the person wants it is as if the person fulfils the Mitzvah every time he puts it on and therefore a new Beracha is required every time he puts it back on. However, the Rabbanan hold that once the basic obligation has been fulfilled by putting it on once, the fact that he still fulfills the Mitzvah by wearing it longer or one more time does not make any difference in reference to his minimum obligation, and therefore the Beracha is not required any more. עשרה שהיו עושין עשר מצות, כל אחד ואחד מברך לעצמו. היו עושין כולן מצוה אחת, אחד מברך לכולן. יחיד שהיה עושה עשר מצות מברך על כל אחת ואחת. היה עושה מצוה אחת כל היום אינו מברך אלא פעם אחת. היה מפסיק ועושה מפסיק ועושה מברך על כל אחת ואחת. The Tosefta states a new law regarding Berachot. It is not related to any Mishna. Meaning that these ten people were sitting in the same room, but each one of them was involved in performing a different Mitzvah. For example, one person was putting on Tefillin, the second person was putting on Tzitzit, the third person was slaughtering a chicken, etc… Then it is considered that each person is involved in his own private Mitzvah and he has nothing to do with the other people present in the room, and therefore each one of them says a Beracha on his own Miztvah to himself. For example, if ten people were sitting together at the table and water was brought to them to wash hands before eating bread. One person should say the Beracha of Al Netilat Yadayim for washing hands before eating for everyone, since all of them are involved in the same Mitzvah of washing hands. The reason that one person should say the Beracha for everyone is the same as when many people sit down to eat together and one person says the Beracha over the food for everyone, as was mentioned earlier in Tosefta Berachot 4:8. We have a principal called Berav Am Hadrat Melech (The King (i.e. God) is glorified among the multitude of people). It gives greater honor to God when many people do a Mitzvah together as one. See Talmud Bavli Berachot 53a. At first this statement of the Tosefta may seem obvious. Since a person is doing many different Mitzvot then he should say a separate Beracha on each Mitzvah since they have nothing to do with each other. However, the Tosefta has a very important point to make. It specifically excludes the opinion of the Tanna Kama in a Beraita quoted in Talmud Bavli (Sukkah 46a) who says that if a person was about to perfom many different Mitzvot he should say one Beracha on all of them. The Beracha according to that opinion would be Baruch Ata Hashem Eloheinu Melech Haolam Asher Kideshanu Bemitzvotav Vetzivanu Al Hamitzvot – Blessed You Hashem, our God, King of the world, Who has sanctified us with His commandments and has commanded us regarding the Mitzvot (commandments). This Tosefta goes like the opinion of Rebbi Yehudah also quoted in that Beraita who says that the person would have to say a separate Beracha on each Mitzvah. The Gemara explains that the reason for Rebbi Yehudah’s opinion is based on the verse in Tehillim (68:20). For example, if the person would put on Tefillin in the morning and not take it off the whole day then he would only say the Beracha once before he puts it on in the morning. However if he decided to take a break from wearing it and took it off for a significant period of time then when he puts it back on again that same day he would have to say another Beracha. I have specifically used the example of Tefillin, because there is an argument in Talmud Bavli (Sukkah 46a) between Rebbi and the Rabbanan if a person would take off Tefillin in the middle of the day and then put it back after a significant break if he needs to say a new Beracha on it or not. This Tosefta follows the opinion of Rebbi who says that he would need to say a new Beracha after every interruption. The reason for Rabbanan’s opinion is not really clear.